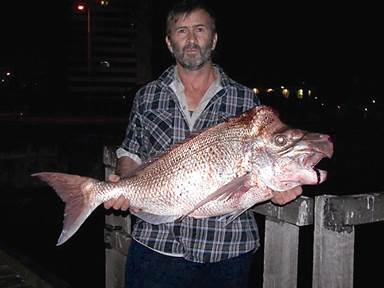 On the 1st of September 2007, Bruce Olsen went fishing about 10 miles off Bunbury, and hooked into a big snapper. He got it up on deck – it measured 94 cm and about 10 kg. Not a record breaker but nevertheless quite respectable. Fillets on big snapper can be a bit stringy, so Bruce released it. But it was a floater so he recovered it and put it in his esky. Might be good for fish patties. When he was back at the jetty Bruce had a photo taken of him holding the fish, after all you don’t catch snapper that big every day. It had the bulbous nose typical of old adult males, and a face only a mother could love. It made for a good photo. After filleting Bruce did the right thing and donated the fish frame to the Department of Fisheries WA for research purposes. They are running a Send Us Your Skeletons program, collecting frames of recreationally caught fish to assess the health of stocks. The main use of the frames is to extract the otoliths (ear stones), which have growth rings like a tree trunk, to age the fish. Watch a video on how to remove otoliths here. A few months passed until Fisheries contacted Bruce to tell him the age of his fish: a staggering 40 years and 10 months. It was the oldest pink snapper they had seen. Fisheries contacted other Australian fisheries agencies asking if they knew of snapper this old. The Victorians said they had a snapper caught in Port Phillip Bay in 2001 that was 40 years and 5 months, slightly younger than Bruce’s. South Australia and New South Wales both had 37 year olds, and Queensland only 23 years. Bruce was the winner. He had Australia’s oldest snapper, and he’d taken a photo, which he gave to Fisheries. Fisheries published the photo and results in a peer reviewed scientific journal. Longevity is actually an important parameter for assessing fish stocks. So, there’s this photo of Bruce Olsen holding a big snapper, just like any typical fisho holding their catch, but it’s published in the Journal of the Royal Society of Western Australia, the caption reading Australia’s oldest recorded snapper. The moral of this story, ladies and gentlemen, is to donate your fish frames (fresh or frozen, with guts intact if possible) to the Department of Fisheries for research. There are quarterly prizes available, and an annual grand prize of a week-long charter fishing trip for two to the Montebello Islands. Details of species required and freezer drop-off points can be found on the Department OF Fisheries WA web page Send Us Your Skeletons. Bruce Olsen donated his frame, became an Australian record holder, and had the whole thing put on the scientific record.